The Preamble is the opening statement of the Constitution. It is a concise proclamation of the values at work in the complete document. It is thought the Preamble to the Constitution was written by Gouverneur Morris, (1752-1816). We do not know with certainty if any one man proposed the words of the Preamble, or if it was devised and revised by a whole committee. This statement gives American citizens, not the government, the power of rule. The Constitutional Convention of 1787 created the most lasting written Constitution ever created by human hands. The United States existed prior to the ratification of the Constitution in 1788. It was a nation organized by the weak threads of the Articles of Confederation. This first attempt at a constitution was a contentious and inadequate document. For one hundred and sixteen days the men who were at Philadelphia, May 25 to September 17, hammered out a document that was the outcome of dozens of compromises and shaped by the issues of the United States under the Articles as well as the failures of well-known European governments of the time. In the beginning of public education, educators taught young people about citizenship. This included an understanding of the United States Constitution. As our country has progressed, civics (the study or science of the privileges and obligations of citizens) has lost a prominent place in the educational process. It is now more important than ever that the Daughters of the American Revolution promote Constitution Week. Constitution Week covers two of the three principles, education and patriotism, the DAR promotes in their “Service to America.” Many chapters have special events planned in their communities—bell ringing; obtaining proclamations from state and local officials; recitation of the Preamble at meetings; distributing Constitution Week kits to students; and displays in public places. New this year for the Constitution Week Committee is a closed Facebook Group. The link is: https://www.facebook.com/groups/176742609408916/ This group is for sharing activities, ideas, and promoting Constitution Week within our Society. Search for DAR Constitution Week on Facebook and request to be added to the group. State and chapter chairs, as well as other DAR members who promote Constitution Week by working with schools and their communities are encouraged to share their events and activities with the group. (Please remember photos of group activities with children should not show their faces unless you have permission from the parents. This is for the safety and privacy of the children.) We hope you find this group helpful and fun! Please let me know what your thoughts are regarding the FB group. 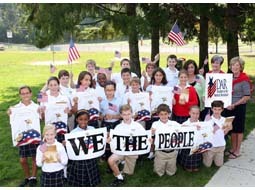 The Constitution Week Committee webpage can be found here: www.dar.org/members/constitutionweek. Check out the tabs titled History of the Constitution; Preamble; Constitution Week Toolbox; Working with Schools; Suggested Activities & Calendar; Additional Resources; and Contests & Awards for Constitution Week resources. This year Constitution Day falls on a Saturday, September 17. If you would like to plan your activities to promote Constitution Day for schools or government facilities on Friday, September 16, or Monday, September 19 that is completely acceptable. Be sure to post your activities and events in the new Facebook group and document your activities on the Chapter Master Report. Thank you for sharing and celebrating Constitution Week!